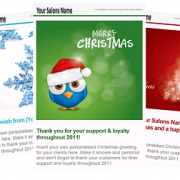 Strengthen customer relationships and cement brand loyalty by emailing your customers one of these awesome professionally designed Christmas eCards. 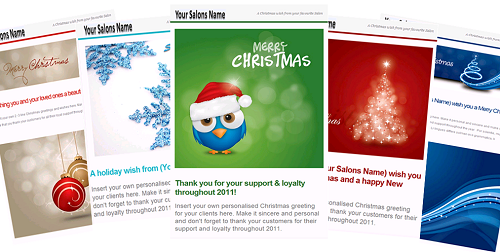 Seven brand new eCards have been posted on Salon Management Studio’s Marketing Store. Check out some of the eCards below. Use Salon Studio CRM’s easy to use email system to open an edit the template. Within minutes, each card can be customized with your Salon’s name, logo, contact details, special offers and personalized email Christmas message.